*I was provided a free copy of this book in exchange for an honest review. Waterfall is an example of why books shouldn't be categorized into genres. It is cataloged under Christian historical fiction, two genres that many people dislike. This will likely keep most people from reading Waterfall. Such a shame. The book never hits you over the head with Christian themes - rather it has basic references to faith. And as a historical fiction book, it is as detailed and exciting as any high fantasy or paranormal novel. Waterfall is much like its name. A slow stream that initially lulls the reader but quickly builds pace and soon throws you straight down the waters of Niagara. 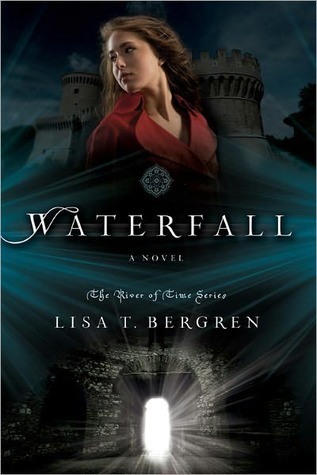 I thought Waterfall was only okay at first, but I became attached to the characters and story to the point when it became really exciting and could hardly put it down. I was impressed at what a believable story Bergren created. Obviously, you have to suspend some sense of reality to believe that a girl could place her hands on a spot in an Etruscan tomb and somehow be thrust back into 14th century Italy...let alone be able to survive in said century without being thought insane or evil. Bergren made sure Gabi knew enough in her modern life to live in 14th century Italy. Because of her parents' jobs as architects and frequent travels, she was fluent in Italian, knew a great deal about medieval history, and even traditional herbal medicine. Add to that some mad skills as a fencer and Gabi is set to go back in time 600 years. I was impressed that the author made sure to cover all the small details of Gabi's life to make the time travel work. In a less skilled author's hands, Gabi's transition to the 14th century would have been laughable. With Bergren's writing, it almost felt real. Similarly, Bergren does a wonderful job of world-building (because 14th century Italy requires just as much world building as a high fantasy novel). The reader can see every inch of the castle, the surrounding countryside, and Siena. No detail is left uncovered. This slows the pace of the book somewhat, but it doesn't drag. I thought it was a nice balance. There was enough action and amusing cultural adaptation scenes that the story felt like more than an info dump. Gabi is a great leading lady. She's the perfect time traveler. Brave, cunning, and adaptable. She was quickly able to change from her modern Italian to an older style - which, realistically or not, sounded more like a Jane Austen novel than Shakespeare. She also figured out much of the local politics and motivations behind characters' actions, particularly Marcello's fiance. She is loyal to her younger sister, stubbornly insisting on doing everything possible to help Lia. Gabi loves passionately, but also reasonably. She doesn't lose her head over a boy. Plus, she can wield a sword! She's a fierce fighter and won't let others stand up on her behalf without her support. Gabi fits the description of most strong female characters in current YA, but what she lacks in uniqueness, she makes up for in likability. Marcello is our leading man. He reminds me of a lot of fantasy heroes. A swashbuckling soldier. The big, brawny guy with a heart of gold. His passion is great enough that he'd give up all his family's ambitions to be with Gabi. Despite being willing to abandon his family's calculated marriage plans, he defends his family and their castle with his life, and of course will fight anyone and anything to help Gabi find her sister. I liked Marcello but he doesn't do it for me quite yet. Perhaps I'll feel more affection towards him in subsequent books. The characters I like best are Luca, Marcello's funny, carefree best friend, and Fortino, Marcello's sickly yet intellectual brother. I'd love to see Fortino and Gabi together. Waterfall is a historical adventure story. It's a fun ride watching the Gabi adjust to a new world and seeing her and her new compatriots fight battle after battle in defense of their land and Gabi's sister. A great start to a new series. I'm really glad that you mentioned that the Christian theme isn't prevalent. I mean, I AM a Christian...but I still don't like most books in the genre. They're too much. I downloaded a free copy of this on my Kindle the other day and I'll definitely be reading it now! I have this book sitting on my shelf and didn't even know it was categorized as Christian! I'll admit I'm also one of those who don't like Christian fiction, so I'm glad you mentioned it doesn't play a big role in the book. I just downloaded this the other day. I usually hate Christian fantasy because I have yet to find an author who writes it well. Usually it is all obvious symbolism and written like a parable. This sounds promising though. Glad you liked it. Thanks for a great review! I have no problem with Christian fiction, but I don't like books that are overly preachy, so I'm glad to hear this one is not. :-) I'll have to look for it the next time I'm at the store. When handled properly, I love a good time travel story and this one sounds like the author made it interesting and plausible. Plus -- ITALY!! And a hot Italian boy. Yay! Excellent review! I have no problem with Christian Fiction and am very happy to see it going a bit more mainstream. I have been wanting this book for awhile and can't wait to read it. Thanks for the excellent review. It is interesting how a genre label can discourage someone to read a particular book - I would probably never pick this one up. I love time-travel books and this one is apparently well written, so I will add it to my TBR. Great review! I am so glad you liked it! :D I think the sequel was even better. I agree about the genre slotting. From all the reviews I've read it seems like this series defies genres and even people who don't like historical fiction or Christian fiction have loved it. I really enjoyed this novel. I loved all the different elements that were thrown in and that Gabi was such a strong heroine. I however didn't enjoy her sister very much. I also thought that Luca was pretty amazing. I just bought this one and can't wait to read it! So glad to know you enjoyed it Alison, our tastes are usually very similar so I'm looking forward to meeting Gabi. I'll be interested to see if Marcello wins you over in the next two books! I also read this book, and I think that you hit the nail on the head with your review. I can't wait for the last book... I'm very excited. Glad to know this isnt preachy. I just downloaded the free kindle version. I often shy away from historical fiction, but I have yet to see anything negative said about Waterfall. I'm completely intrigued by this epic adventure theme it carries, along with the sweeping romance. Glad I grabbed it for free on Amazon yesterday. I loved this book! Love the time travel and the HOT guys! Great review! It's just positive review after positive review with this one. I hope I can read it soon. I agree about the rating with this one. When I hear Christian histfic, it doesn't exactly get me too excited about reading it, but your review and others have assured me that's it's so much more so I look forward to reading it! Alison I'm so glad you liked this one! It definitely defies the genre box it was placed in, and I love it for that. It's one of the reasons I try to push this book so hard on others. It's a great book that just needs some help to find a broader audience. I actually found Marcello less interesting in the second book and am growing more attached to Luca. Fortino has some interesting stuff happen in the second one. I hope you read on!